Do I Need a Dosage Administration Aid? 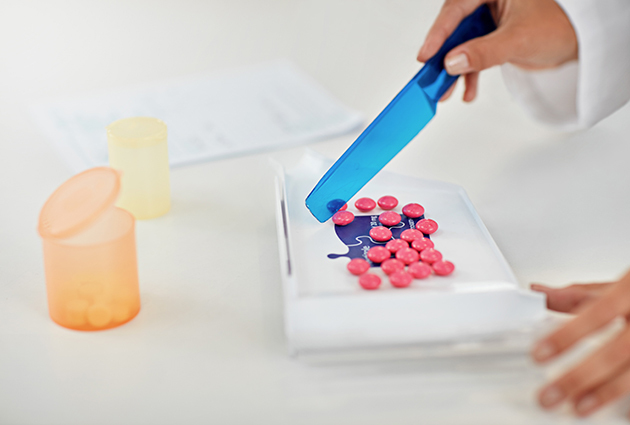 Dosage administration aids (DAA) come in all shapes and sizes and can be particularly useful for some people, however, it is a personal choice and not a recommendation that everyone uses one. The most common DAAs are dosettes, which are refillable/reusable, and webster packs, which are discarded once completed. Sachets have more recently become available, but like webster packs, your pharmacy has to prepare them. Automated dispensing devices are also available. You (or someone else) can conveniently pack them at the beginning of each week so you don’t need to worry about pulling all the original containers out each day to take each dose. Saves you time and worry thinking about when each of your medications is due. They can help you keep track of when your last dose was and when your next one is due. When you get distracted with other things it is easy to forget if you have actually taken your dose, especially if you are not in your normal routine. If you did not take it, you would know because it would still be sitting in your DAA. For people who get muddled with their medications, it may be safer if someone else prepares their medications for them. If you are going away for 1 or 2 weeks, you can take the packed DAA so you don’t need to take the whole bulk of your medications with you. If you suspect a loved one is not taking their medications, you can sometimes use a DAAs to check (you can see if the packs still have medications in them). Some DAAs are specifically designed for blind people and have Braille on them. If someone else is packing your medications for you, it is easy to lose track of what you are taking and why. This can also be problematic if you need to stop a medication suddenly and you don’t know which tablet it is. Not all medications can be packed in a DAA as it may affect how they work. This can create problems if you are stable on a medication, if there is no alternative, or it is packed unknowingly. Some medications shouldn’t be taken together, so if you are unaware of this it could also create problems. Some people can get confused about the order in which they should be taking their medications. Medications can be taken out of reusable DAAs without you knowing. If a mistake is made packing the DAA, the mistake may be carried on for days before someone picks it up (if they pick it up). When there are changes to your medications there can sometimes be a delay in getting a new updated pack (from your pharmacy) or there might be confusion about which packs are old and which are new. They can only manage oral medications and do not help with the management of other medication forms such as patches, inhalers, injections, eye drops etc. Some people find them hard to use because of arthritis, poor eyesight or other physical issues. It is possible with some DAAs for tablets to fall out, potentially without you knowing. It can add to the cost of your medications. If someone wasn’t taking their medications regularly but then started taking them regularly because they started using a DAA they could experience unintended side effects or problems that weren’t anticipated. These are just some of the advantages and disadvantages of DAAs. Some people see DAAs as a quick fix to make taking their medications easier but this is not the best way to view them. If you want to use a DAA for convenience then you should ideally be packing it yourself so you know what you are taking. Also, if you or someone else (not a pharmacist) is packing your medications, always check first that they can actually be packed and if they are okay to be packed together. If you are wanting to use a DAA because you think you are taking too many medications and you want to simply things, there may be another solution. Having your medications reviewed can help to identify whether there are combination products or alternative therapies with less tablets to take or more convenience. In some cases, some medications could even be ceased. If you tend to get confused about your medications, a medicine review done by an accredited pharmacist could help you demystify your medications. Your pharmacist can make you a list that clearly specifies what to take and when, so you can follow it and continue packing your DAA yourself. If you still get muddled or don’t feel confident packing it yourself, it would be best to get someone else to pack it for you. Before you or a loved one commits to using a DAA, it is important that you know all your available options, including the pros and cons for each. Your pharmacist can help you decide what would be most suitable for you. previousWhy Get a Medicine Review? nextWhat Is the Difference between an Allergy and an Adverse Effect?